The week of March 25th has proven to be the best week for our tulips this year. Next week they will begin to decline and by week’s end all the white petals will likely be spent. So, get out and enjoy them while you can! Some citizens have expressed interest in obtaining the bulbs after the blooming season ends. Tulips are an annual flower in Texas as it does not stay cold enough for the bulbs to bloom again each year. However, the bulbs can be harvested and kept in a refrigerated climate until planting next winter. The city does not have the resources to refrigerate the bulbs but feels it is in the best interest of the city to allow individual citizens to do so if they desire as it only beautifies the entire city next season. The Parks Department will be pulling the tulips and saving some of the bulbs for those citizens who want them the week of April 8 weather permitting. They can be picked up on a first come first serve basis at the Recreation Center Lobby starting the week of April 8 (weather permitting) during regular business hours while supplies last. Although tulips are bulbs, it is best to consider them as annuals here in Texas. Successive year’s blooms will be inferior, if present at all. Texas winters are too mild to give them the chilling they need to flower properly. To prevent drying out, store bulbs in dry peat moss, perlite, vermiculite or sand in a porous bag or shallow tray. Store them in a cool (35°-50°F), dry, well-ventilated area for replanting in the winter. Refrigerate the bulbs for at least six weeks prior to replanting. Generally planted in Texas around Christmas or the first two weeks of January, tulips should be planted in sun or part shade six inches deep and four to six inches apart. Tulips look better when planted in clumps of three, five or seven. They require well-drained, fertilized soil. There are several “bulb boosters” or fertilizers available as well as the traditional bone meal. Mix any of these with soil in the bottom of the planting hole. For bigger, brighter blooms, use a liquid plant food in early spring. Great news! Registration for Fall 2018 is now open. Please visit our website at www.duncanville-soccer.com to register online. Registration will close August 1. This season we will offer late registration beginning August 2-17 with a $15 late fee. Please visit our site for more details. ¡ buenas noticias! El registro para el otoño 2018 ya está abierto. Por favor visite nuestro sitio web en www.Duncanville-Soccer.com para registrarse en línea. El registro se cerrará el 1 de agosto. Esta temporada vamos a ofrecer un registro tardío a partir del 2-17 de agosto con un cargo de $15 por demora. Visite por favor nuestro sitio para más detalles. Wristbands are FREE and will be available for pick up at the Duncanville Recreation Center – 201 James Collins Blvd., Duncanville, TX 75116 after JUNE 12th. Limit 5 wristbands per person; must be 18 or older to pick up. The following items will not be permitted inside of the park: alcohol, glass containers, tents, canopies, umbrellas (other than hand held), all animals other than service animals, and fireworks. ADA-accessible parking will be located in the parking lot West of City Hall—203 E Wheatland Rd., Duncanville, TX 75116. Sponsors and vendors are invited to register with the Parks & Recreation Dept. at 201 James Collins Blvd., Duncanville, TX 75116 or by calling 972-780-5070. Beginning Monday, June 5th, Find Your Adventure 2017 Summer Camp, opens with a treasure chest full of fun, crafts and field trips. Field trips include places like “Going Bonkers”, “Perot Museum”, and “LEGOLAND” to name a few. Breakfast, lunch and snack are provided. 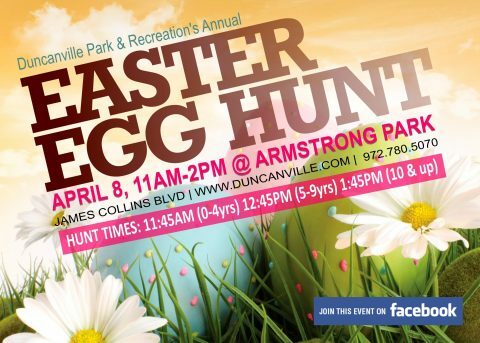 Join the Duncanville Parks and Recreation department in starting your summer off safe and fun. Complete the registration packet and turn it in to the recreation front desk. Space is limited so get your registration in as soon as possible. Call 972-780-5070 for more information or if you have any questions, please call the number in red. Memorial Day recognized as Decoration Day after the Civil War became a federal holiday in 1971. It is celebrated on the last Monday in the month of May. It’s dedicated to honor all Americans who died while in military service. “The National Moment of Remembrance encourages all Americans to pause wherever they are at 3 p.m. local time on Memorial Day for a minute of silence to remember and honor those who have died in service to the nation.” Information cited from http://www.military.com/memorial-day/. Our Easter Egg Hunt begins very soon. The little ones start hunting just before noon. The items sought are not square. Saturday, April 8th at Armstrong Park is the place to be. Today is the last day to give your input for the Park Master Plan Survey. The Parks and Recreation department wants to thank all of those who have given their input on the survey. The City still invites you to take this anonymous needs assessment survey to assist with developing priorities for the Park Master Plan. The survey is available in English and Spanish on the City’s website at www.duncanville.com. If you would prefer to fill out a hard paper copy in English or Spanish, these surveys are located at the Recreation Center, City Hall, Library and the Duncanville Fieldhouse. Please, only one survey per household. 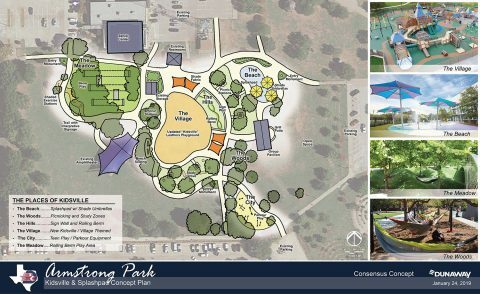 Should you have any questions about the survey or its results, feel free to contact the Director of Parks and Recreation Bart Stevenson at bstevenson@ci.duncanville.tx.us. Thank you for your support and participation in the future of Duncanville Parks and Recreation.